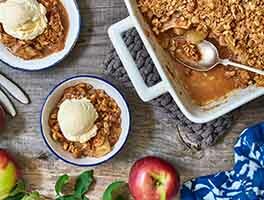 Apple pie: American icon, most popular pie, and the ONE dessert everyone has to make for Thanksgiving. With its flaky, buttery crust; tart-sweet apples, and wonderful cinnamon-y aroma, a slice of warm apple pie is the perfect end to any repast, from casual lunch to elegant dinner. Add vanilla bean ice cream, and you’ve got a dessert for the ages. For extra crunch and shine, brush the top crust with milk (or an egg white beaten with 1 tablespoon of water), and sprinkle with coarse sugar. Place the pie in the refrigerator for 10 minutes to firm up the crust while the oven finishes heating. 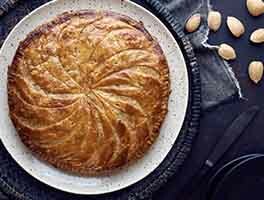 To make the rose apple pie pictured on the Fall 2018 cover of Sift, line the pie pan with a single pastry crust and flute the edges. Wash 5 or 6 red-skinned cooking apples and set aside; don't peel them. Have the lemon juice from the ingredients list on hand. In a small bowl, whisk together the sugar, flour, ClearJel, salt, and spices. Sprinkle over the pastry in the pan. Slice the apples from the outside toward the core as thinly as you can (you should almost be able to see the knife through the apple). Cut the slices in half from top to bottom to make two semicircles. Form a 2 1/2" circle out of a folded piece of aluminum foil, place it in the pie shell, and arrange the slices skin side up inside the foil, working from the outside in to form a rose. Move the foil circle as you build more roses toe keep them intact; after the pastry is filled with roses fill any gaps between them with extra apple slices. To make Salted Rosemary Caramel Apple Pie, omit the sugar and butter from the filling ingredients listed above and top the apple filling with a batch of Salted Rosemary Caramel Sauce. Bake as directed. For the best apple flavor, use more than one variety of apple in your filling. Use apples that will hold their shape during baking: Jonagold, Granny Smith, Ginger Gold, Cameo, Northern Spy, and Delicious are some good choices. Here's a tasty variation: Cranberry-Apple Pie. 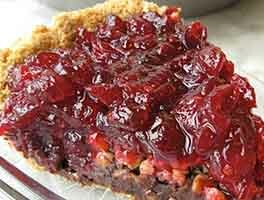 Add 1 cup dried cranberries to the filling, and bake as directed. 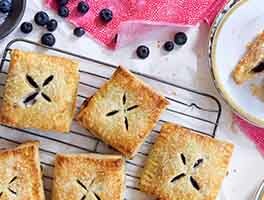 For a simple sugar-crumb crust in place of a pastry top crust, work together 1/2 cup each sugar, unbleached all-purpose flour, and butter (8 tablespoons), plus a pinch of salt, until sandy textured. 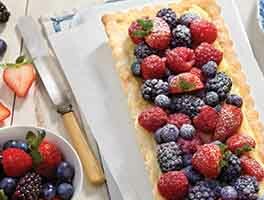 Sprinkle atop the pie in place of the top crust; save the remaining top-crust pastry for another single-crust pie. Followed this exactly. Perfecto! The crust was on the money. I followed this recipe to a T and I made an absolutely very great tasting pie. It was easy to make and received several compliments. Thanks for sharing your recipe signed, Newbee. I was asked to bring a vegan dessert to potluck so I tripled the crust recipe using 100% vegetable shortening rather than part butter and two times the filling recipe leaving the butter out. I used a half sheet, rolled out 55% of the dough for the bottom crust and 45% for the top crust. It's a heavy pan so I baked it about 70 minutes. I made some caramel sauce to serve on the side for those who weren't vegan. It was very well received by all and made 24 good sized pieces. I love the crust making technique. It took longer than usual but came out flaky and beautiful. The filling however, needs adjusting. Next time I will double the spices, added some brown sugar, and omit usage of granny smith apples (I don't think they mixed well with the boiled vinegar). I used a different pie crust, but wanted to comment on the deliciousness of this filling - super yum! I was rushing to get this third pie in the oven yesterday on Thanksgiving and forgot to add the last bit of my boiled cider into the apple/spice mixture. I popped the top crust off (thank you, super cold pie crust!) and just drizzled the cider over the apples. Wasn't sure whether I'd messed it all up and/or whether my family would like this departure from our traditional apple pie. No worries on both counts: my oldest declared this her all-time favorite pie. I used Instant Clear Jel and we loved the luscious (but not soupy) result. I'm back for more boiled cider and to share my thanks, yet again, to KAF! At the last minute, my son decided he wanted to make an apple pie for Thanksgiving dinner to go along with the traditional pecan and pumpkin. Even though he is 27, he's still expanding his kitchen skills and had never made a pie from scratch . We made the pie per the recipe except we did not have boiled cider. We substituted apple juice to keep the liquid volume on track. It came out perfectly. Everyone had at least one slice. The filling was moist, but not runny. The crust was light and flaky. I used a combination of Granny Smith, Honey Crisp, and Golden Delicious apples. Although the filling was a bit wet and hard to cut an intact slice out, the flavors were spot on and the crust was flaky and delicious. 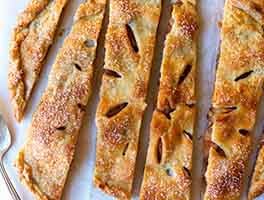 The recipe didn't account for the time it takes to peel and slice all those apples though, so make sure you factor that in when planning your bake. I am a pie maker so used a different crust. But the combination of apples, sugar, and thinkener in this filling is great. I used a little less cinnamon and spices and no vanilla or cider, but the lemon with the fresh fragrant apples were perfect. The tip to boil down the excess juices (my apples gave off a lot) before adding back to pie (in the comments, not the recipe) was a great idea. I made a larger pie for 12, and everyone love it. Perhaps the best apple pie ever, and the apples were the stars. Well done, King Arthur! You made me the most popular person at the Thanksgiving table. I used 2 Granny Smith and 2 Gala apples and balance of tart and sweet was excellent. Thanks for another awesome recipe! This is the first time I've made an apple pie not out of my family's recipe book, and I'm glad I was brave and branched out. Quick question, though: By the time I scoop the apples into the pie crust, there is a bunch of liquid/spices at the bottom of the bowl. Should I dump that in, too, or would it make the pie too soggy? I left it out this time but I'm worried I'm missing out on some of the flavor. Thanks!